You’ve got to hand it the McIlhenny Co., the company behind Tabasco. Faced with environmental issues on the island where the company’s signature product has been made for 150 years, Tabasco is still pushing forward with a number of new creations. For example, a Diamond Select $35 bottle of Tabasco to celebrate that sesquicentennial. 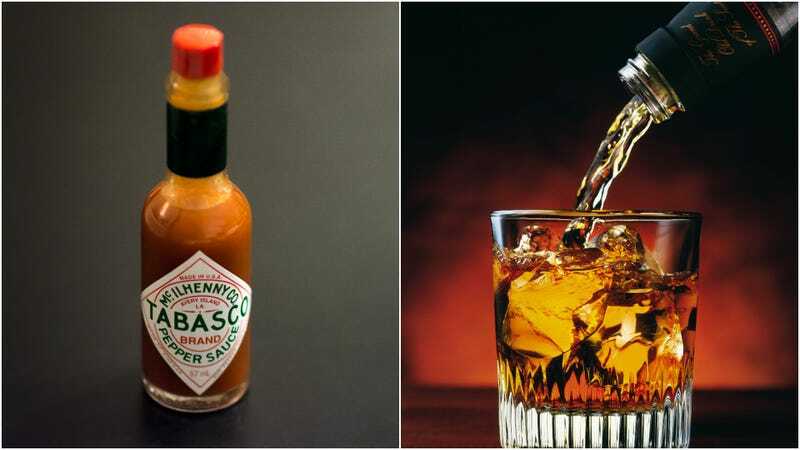 And now, a collaboration to create a new brand of Tabasco-infused whiskey. The Spirits Business described: “George Dickel Tabasco Brand Barrel Finish has been aged for 30 days in the barrels, which previously aged Tabasco peppers for three years, imparting a spicy flavor.” Then, distilled Tabasco is added to the whiskey. The bottle even mimics Tabasco’s legendary green cap. (It’s not the first alcohol to use a Tabasco barrel, though; breweries including River Rat Brewing have brewed beers that were later aged in used Tabasco barrels.) Jeff Parrott, director of American whiskey development at parent company Diageo, stated, “Both brands have such a rich history, and we’re proud to collaborate with our friends at McIlhenny Company to marry their unique flavor with our quality Tennessee whiskey.” The spiciness of the whisky has led some reviewers to dub it a refined version of Fireball. Instead of shots, the elixir is recommended “served neat with celery salt on the rim, or with pickle juice and an ice chaser.” We’ve got a better idea: This whiskey could kick our Sunday Bloody Mary efforts up several notches.